James McArdle lived with his family in Brandon. By the time of the 1911 census his parents, Owen and Margaret, had had seven children. Owen and Margaret both hailed Inniskeen, County Louth in Ireland. Owen worked as a colliery labourer (1891) and then coke drawer (1901 and 1911). Coke drawers emptied the coke ovens which heated coal to make coke. By 1911, James was 14 years old and working as a blacksmith’s assistant. In August 1916 he attested to the army, by which time he was working as a bank labourer. His service record shows that he was posted to the British Expeditionary Force in France on 2 January 1917. He was originally recorded as being attached to 3rd Battalion Durham Light Infantry (DLI) but then on 3 and 4 January his record shows that he was then posted to 15 DLI and then 18 DLI (also known as the Durham Pals) on those consecutive days. His service record also records that he was being tended by the 94th Field Ambulance when he died of wounds received in action. James McArdle is commemorated on the Ploegsteert Memorial in Belgium, on the plaque at the Brandon British Legion and at Saint Patrick’s Church in Langley Moor. 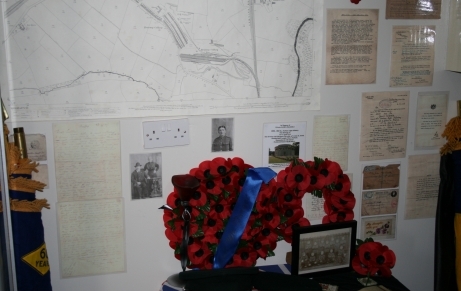 Brandon British Legion has a display of some of his documents, including letters written home from the Front.